Many of these sports related conditions can be treated non-surgically. Some forms of treatment are by either one of the following or a combination: physical therapy, heel stretching exercises, orthotics, muscle and tendon tapping, icing, anti-inflammatory medication, corticosteroid injections, using orthotic inserts and using more appropriate/supportive footwear. A condition that affects the Achilles tendon, the largest tendon in the body. Achilles tendinitis typically occurs because of overuse (often sports related) and degeneration, or wearing down with age and time. Plantar fasciitis is so increasingly common, that nearly two million people are treated for it each year. Plantar Fasciitis happens when the band of tissues, the plantar fascia, supporting the arch of your foot absorbs too much stress. When the tissues are strained from activities like running, they become inflamed, causing pain at the bottom of the heel. An ankle sprain can cause minimal pain or severe pain. It can be painful to walk and/or stand. 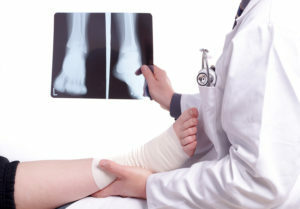 All ankle sprains involve twisting of the foot, causing damage to the ligaments of the ankle. 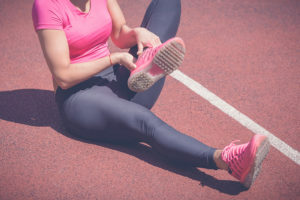 Inversion ankle sprains are the most common type and are caused by twisting the foot inward, resulting in damage to the outer ligaments as they are stretched. Eversion sprains, caused by twisting the foot outward, usually cause more severe damage to the inside ankle ligaments. Neuroma is a condition involving a pinched nerve in the foot. The main symptom people experience with a neuroma is pain between the toes while walking. Other symptoms often associated with a neuroma are, pain in the ball of your foot and/or tingling and numbness. While there is not an exact cause, many different things may play a role in the development of a neuroma, such as flat feet or feet with high arches, overuse or stress, shoe size and style, and trauma. Jeri M. Gruenes, DPM expressly disclaims all warranties of any kind, whether express or implied, related to any products offered for sale on this web site. Jeri M. Gruenes, DPM further expressly disclaims any product warranties of effectiveness or fitness for any particular purpose or use. You are solely responsible for your use of, or reliance on, any products offered for sale herein, and any consequences arising out of such use or reliance. In no event, will Jeri M. Gruenes, DPM be liable for any damages resulting from use of or reliance on any such products, whether based on warranty, contract, tort or any other legal theory.